Over watering your lawn causes more damage than lack of water. That is because most turf grasses can handle dry spells, but not flooding. Most grasses require 1 - 1. 5 inches of water per week. This is enough water to moisten the soil to 4 - 6 inches below the surface for clay soils and 8 - 10 inches for sandy soils. Do not guess at how much water your lawn is getting. For measuring Mother Nature's contribution, invest in a rain gauge. If at the end of the week she has contributed enough, hold off adding more water. If she comes up short, you will want to add some supplemental watering. If you have an irrgation system, measure how much water the sprinkler is putting down. Therefore, watering early morning gives the grass time to dry, eliminating a chance for fungus. Not enough watering will stress the lawn; prolonged drought weakens the root system and invites lawn diseases like necrotic ring. You will see brown patches and mistake it for grub damage. Refer to Websites on grass diseases. So, as a general rule, you want your lawn to get about an inch of water per week. But remember certain times of the year and certain conditions can change that Rule of thumb. You will have to follow local reguations when there are watering bans, but just remember grass is a very resilentant plant and less water is acceptable. When the rains do return, your lawn will come back with a little encouragement on your part. If you do not have an irrigation system, invest on Timers and place on your faucets. This method will help you a ton. There is more to mowing than just cutting the grass every Saturday. One of the most fundamental steps to a perfect lawn is getting the mowing height right for the season. Mowing height is important because the grass uses the extra length to absorb the sunshine it needs to grow and develop into a healthy plant. Thus, cut high in the hot months (no shorter than 3+ inches to prevent burning or drying thus maintaining the needed moisture); And lower in the earlier part of spring and late fall (2 inches). Leave the clippings on the lawn after you mow. This not only saves time and energy, but also the clippings decompose and add vital nutrients back into the soil. Clippings contain the same beneficial nitrogen, phosphorus and potassium nutrients as that expensive bag of fertilizer. The type of mower does not matter, but the blade's condition does. A dull blade tears at the grass. Take a close look at a grass blade a few days after mowing. If the blade is dull you will notice a jagged brown line across the tip of the cut grass. This is a good indication that your blade needs sharpening. Professional mowers sharpen their blade's about every 8 hours of use. For most homeowners, twice a year is recommended. The jagged edges caused by a dull mower blade make it more difficult for the grass to fight off pests and disease. Contact Sutherland's Organic Solutions if you need help diagnosing lawn issues. 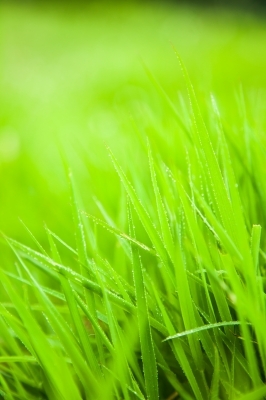 Our Organic Lawn Service also includes aerating, calcium treatments, athletic field turf care, and organic pest control.